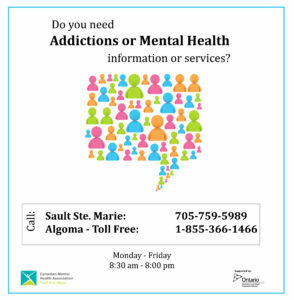 The Canadian Mental Health Association, Sault Ste. Marie branch is currently seeking applicants for the Board of Directors. Be an effective community leader. Join our growing organization and support the vision of quality mental health programs and services in our community. Add your talents to our vision. Orientation and training are provided. We are especially interested at this time in volunteers with experience in Finance and Business Administration, but are also interested in candidates with experience in Fundraising/Marketing, Board Governance, and those with a passion for supporting mental health awareness in Sault Ste. Marie. CMHA Sault Ste. Marie strives to be a culturally competent organization, representative of Francophone, multi-cultural, LGBTQ and other backgrounds that reflect the diverse makeup of Sault Ste. Marie. Participation of people with lived experience is integral to our work as Board members. Volunteer Application Forms can be found on our website and provided to Central Access and Information by email at information@cmhassm.com. CMHA Sault Ste. Marie, 386 Queen Street East, Sault Ste. Marie ON, P6A 1Z1.